#2 Round Point D-Handle Steel Shovel, Contractor Grade. Price/Each. 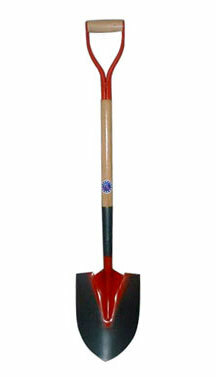 The D-handle round point shovel is a versatile tool for general construction, gardening and landscape work. Blade size: 8-3/4 x 12"
#8 STEEL SCOOP, 14 Inch WIDE x 16-1/2 Inch, ASH STEM/HANDLE, METAL D-GRIP. OVERALL 44-1/2 Inch. PRICE/EACH. D-HANDLE FOR STEEL & ALUM SCOOPS. Made with ash wood and has a metal D-grip. Foxy #358. Price/Each. TAPERED-END #1 HARDWOOD HANDLE, 1-1/8 in. TAPER, 8 FEET (96 in.) LONG. (CARTON OF 12). PRICE/CARTON.